Yes, this is a vegan dessert and it’s not Paleo but I promise that I am posting a Paleo one in just a bit. I wanted to post this because holy shizz, I love cookie dough ice cream and this recipe from Minimalist Baker looks amazing and not too difficult. The night before, place your ice cream churning bowl in the freezer to properly chill. Also, make sure you soak your cashews overnight OR the next day for at least 6 hours. Be sure to drain before adding to blender. Add all ice cream ingredients to blender and blend until creamy and smooth, scraping down sides as needed. Use the “liquify” or “puree” setting if you have it. You want it to be completely creamy and blended. Chill mixture in the freezer for 1.5-2 hours, or in the fridge overnight. Add chilled mixture to ice cream maker and churn according to manufacturer’s instructions – about 45 minutes. It should look like soft serve. If for some reason it doesn’t thicken enough, put the mixture (still in the ice cream churning bowl) and pop it back in the freezer to thicken before churning once more. In the meantime, add vegan butter, peanut butter, brown sugar and vanilla to a mixing bowl and use a mixer or wooden spoon to combine. Add flour a little at a time and stir until thick and slightly crumbly. Add in a little coconut or other non-dairy milk to add moisture. Lastly, add chocolate chips and stir once more. Transfer to fridge or freezer to chill. Once the ice cream is thick like soft serve, add in 3/4 of the cookie dough, crumbling it with your hands as you add it in. Then transfer to a freezer-safe container and sprinkle in the last bits of cookie dough for extra texture. Cover well and freeze for at least 4-6 hours or until firm. Set out for 15-20 minutes before serving to soften. Will keep for up to 1 week, though best when fresh. Well, according to Starbucks and Facebook, pumpkin season is here! 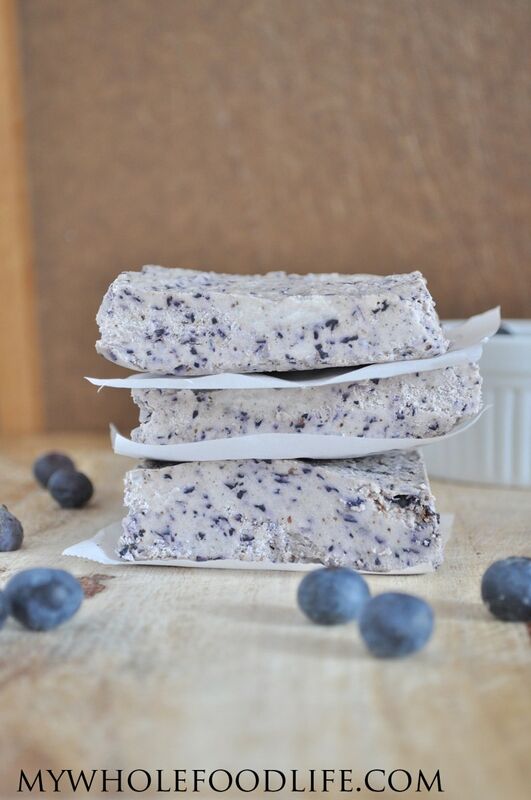 So here is a treat from Juli at PaleOMG for you to try! Grease an 8×8 glass baking dish with ghee, coconut oil or butter. Mix all ingredient together in a large bowl until well combined. Let cool for 10 minutes before cutting and serving. 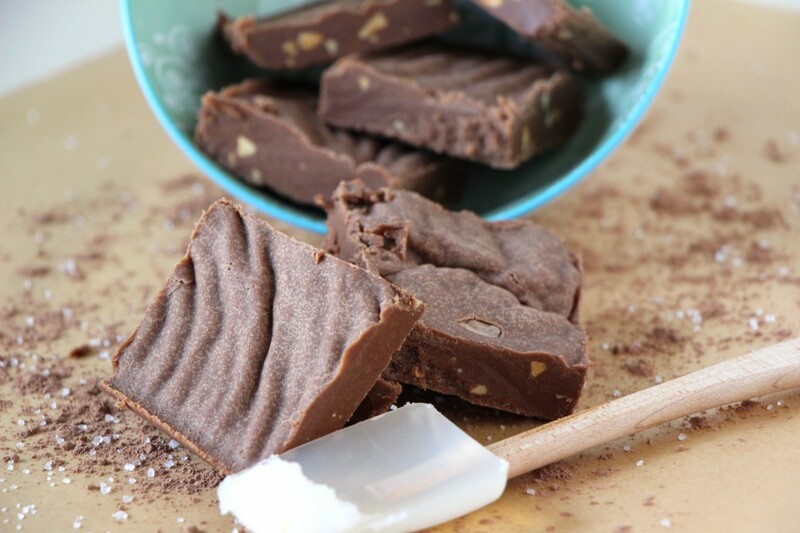 Paleo Parents has a delicious looking fudge on their blog, courtesy of Just Enjoy Food. Life is too short to not eat fudge. Line a 8×8 pan with parchment paper. Add the nut butter and coconut oil to a medium saucepan and heat over medium, stirring with a metal whisk until the coconut oil melts. Add the cocoa powder, collagen, salt and honey and stir until combined. Once the fudge is completely mixed together, take off the heat and stir in the vanilla extract. Pour the fudge into the pan and put in the refrigerator at least 2 hours. Cut with a sharp knife and serve. Store in the refrigerator or freezer. Try these yummy dessert cups from Paleo Newbie today! Grease bottom and sides of a mini-muffin pan. Combine all the cup ingredients above into a bowl and mix well by hand. Press into the bottom and sides of each well to form a cup. Bake unfilled cups 8-10 minutes, or until shells are lightly browned. Combine fresh lemon juice, eggs and raw honey in sauce pan over medium heat. Slowly add the coconut oil. Continue to stir. Watch closely. Once the lemon mixture starts to coat the back of your spoon it will start to turn into a custard. It will thicken quickly. When thickened, remove from heat and set aside. 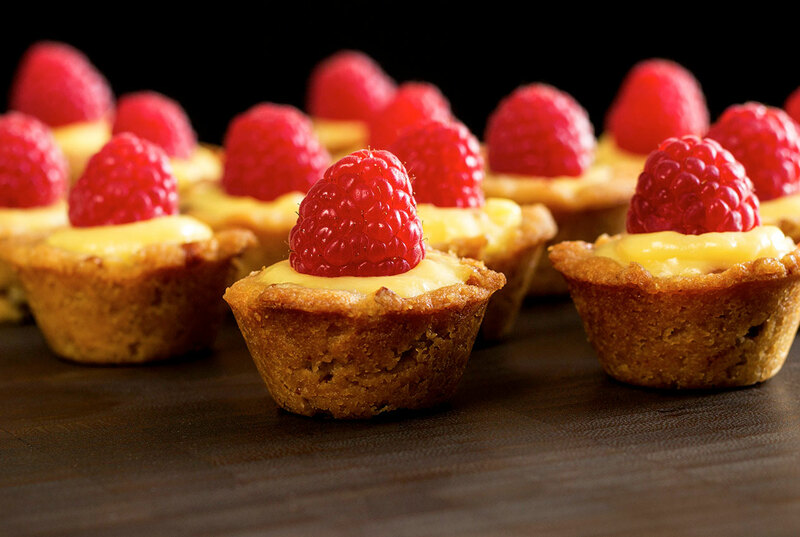 Place a 1/2 – 1 tsp of raspberry jam in the bottom of each cup. Next fill each to the top with lemon custard. Top with a fresh raspberry. My Whole Food Life has s delicious dessert that only has 5 ingredients, and doesn’t have to be baked at all! Combine all ingredients in a food processor until the mixture is smooth. Line an 8×8 pan with parchment paper, leaving enough room for some paper to stick out the sides. Dump the mixture into the pan and spread it out evenly. The mixture is very thick and you may need to wet a spatula to help spread it evenly. Once the mixture is in the pan. Gently press down using the extra sides of parchment paper. Stick the pan in the fridge to firm up. This should only take about 15-20 minutes. Once the mixture is firm, lift the whole thing out by the edges of parchment paper. Use a pizza cutter to cut into squares. Store these bars in the fridge in an airtight container, with a piece of parchment between each bar. They should last at least a week in the fridge and you can also freeze them for longer storage. Enjoy! 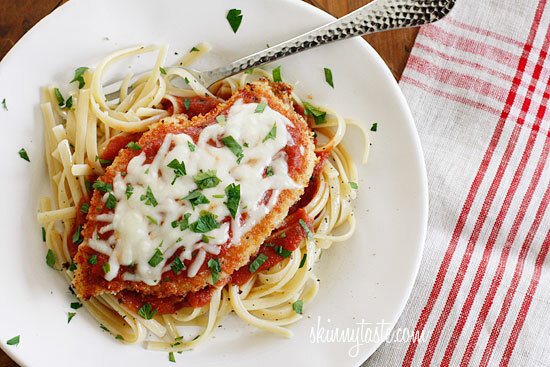 Here is a classic, Chicken Parmasen, but lightened so that you can enjoy it guilt free. You could also use zoodles in place of the pasta. Combine breadcrumbs and parmesan cheese in a bowl. Melt butter in another bowl. Lightly brush the butter onto the chicken, then dip into breadcrumb mixture. Place on baking sheet and repeat with the remaining chicken. In a small saucepan over medium heat, combine cream, maple sugar, vanilla extract and salt. Stir until completely combined. Bring to a boil, then set a timer for 12 minutes, being sure not to let the mixture boil over. After 12 minutes, reduce the heat to low and simmer for 5 more minutes or until the caramel coats the back of a spoon. Remove from the heat, let cool. Place a small saucepan over medium heat. Add raspberries and honey. Mix for about 10 minutes until raspberries have completely broken down into a sauce. Place in a blender to puree then press puree through a fine mesh strainer using a spoon to get out all of the puree, leaving behind the seeds. Pour the raspberry puree into the caramel sauce, place over medium heat and mix to combine and soften. Pour raspberry caramel sauce over ice cream and top with coarse sea salt. While the squash is baking, slice the kale leaves into 1/3 inch-ish ribbons and place in a large bowl. Cut the shallot in half lengthwise, slice the halves into thin half-moons and set aside. Chop up the herbs and toasted nuts as well, set them aside with the shallows. When squash is cool enough to handle, place the steamer basket of broccoli into the pot with the simmering water. Put a lid on it and allow broccoli to steam for 3-4 minutes, or desired doneness. While broccoli is steaming, scrape the spaghetti strands out with a fork into the large bowl with the sliced kale. The heat from the squash should wilt the kale slightly. Pour a big splash of the dressing into the bowl, season with salt and pepper and lightly toss the squash and kale. Preheat oven to 350 degrees. Use the coconut oil to grease an 8×8 pan. Mash your banana and add it to the bowl with the eggs; add the honey and vanilla as well. Bake your bars in the pre-heated oven for 20-25 minutes. Keep an eye on them – when the edges are golden brown and the center is firm, they’re done! Freezing these is a cinch too! Simply wait for them to cool, cut them to the desired size and store them in a freezer container or freezer bag. You can defrost them quickly by popping them in the microwave for about 30 seconds. You can also pull out a few the night before you want them, and just leave them in the fridge-they’ll be defrosted by breakfast the next morning. Stephie Cooks has a delicious looking recipe for strawberry crumble. Double or triple the recipe, and it makes the perfect dessert for a summer cookout, especially when you serve it with ice cream! In a mixing bowl, toss together the strawberries, tapioca starch, vanilla extract, lemon juice, and maple syrup. Transfer to an 8” x 8” baking pan. Mix together the ingredients for the toping in a mixing bowl. Evenly spread it over the strawberries and bake in the oven for 30 minutes, until the strawberries are juicy and bubbly and the topping is golden-brown. Let stand for 10 minutes before serving with ice cream.